The Charles Rennie Mackintosh Tour provides an excursion showing all the Charles Rennie Mackintosh buildings mentioned here. An added excursion to Hill House, Helensburgh, can be included, although, as Helensburgh is 22 miles from Glasgow city centre, time constraints will mean fewer of the Glasgow sites can be included, or it can negotiated at an extra cost. Mackintosh was born at 70 Parson Street, Glasgow, in 1868. 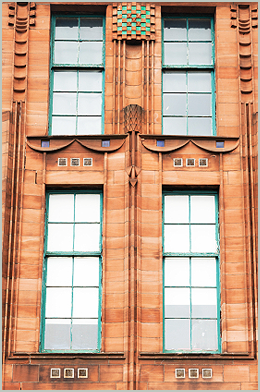 He worked with the Honeyman and Keppie architectural practice, where he commenced his first major architectural project, the Glasgow Herald Building, in 1899. He became a partner in Honeyman and Keppie in 1907 and in 1909 he designed Scotland Street School, his last major architectural commission. In 1925 Mackintosh and his wife Margaret moved to southern France, returning to London in 1927, where Mackintosh was diagnosed with cancer. He died on December 19, 1928, at the age of 60, and is buried at Golders Green Crematorium in London. Charles Rennie Mackintosh designs have gained in popularity since his death, and the enduring nature of his legacy was underlined when, in 1996, his House for an Art Lover was finally built in Glasgow’s Bellahouston Park. 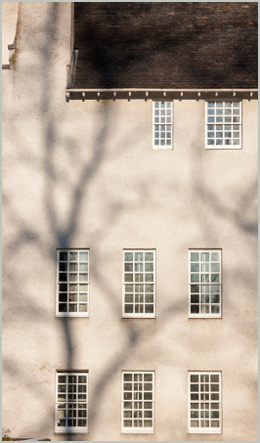 The Charles Rennie Mackintosh Society exists to encourage a greater awareness of his work as an architect, artist and designer. The most striking elements of Martyrs’ School are the two matching stairwells topped with curved canopies, which are an integral part of the roof structure. This is now the headquarters of the Charles Rennie Mackintosh Society. 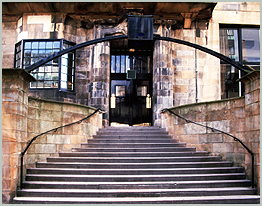 The building shows Mackintosh’s unique design skills, with Art Nouveau detailing both inside and outside. The church received a £1 million renovation in 2007. The home of the Glasgow Herald newspaper from 1870 to 1990. Mackintosh is credited with the extension of the original building in 1893-95. The building has since been transformed into The Lighthouse Gallery. The Halls were completed in 1899, and the building is more conservative than other Mackintosh commissions, although a number of ‘Mackintosh touches’ are in evidence. Boasting a frontage of white glazed bricks contrasting with blue brickwork over the sculpted sandstone ground floor, it is unfortunate that this building (1901-04) is in a narrow lane with limited views of the architect’s vision. This imaginatively-designed school would have been considered ultra-modern for its day, with its twin towers and light-reflecting leaded glass. Opened in 1906, it remained in use as a school until 1976 and since 1990 has served as Glasgow’s Museum of Education. Cited by architectural critics as one of the finest buildings in the UK, this is one of the few Art Nouveau buildings in Glasgow and one of the must-see icons of the city. This was designed for a competition in 1901, but Mackintosh’s plans were never realised until 1996 when it was completed in Bellahouston Park and opened to the public, used as a conference and function venue. Mackintosh added the amazing facade of the Willow Tearooms to an existing commercial building in 1904. Architecture and interior design work together to produce a stunning and timeless result which has been admired for over a hundred years. Standard tour (two hours) – £65, starting in Glasgow City Centre (£168 from Ocean Terminal, Greenock) Longer or customised tours are available on request. Costs are per five-seater taxi (six-seater available on request).